In Ontario, these firm root vegetables are fresh out of the ground from June to October, normally with their tops on. However, beets store very well and remain very firm in cold storage with their tops removed. 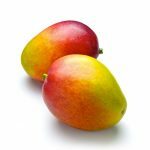 They are available for most of the remaining months of the year from cold and humidity controlled storages or with their tops on and freshly dug from other parts of the world. There are many different ways to incorporate them into your meals! Enjoy the roots and greens either raw or cooked. 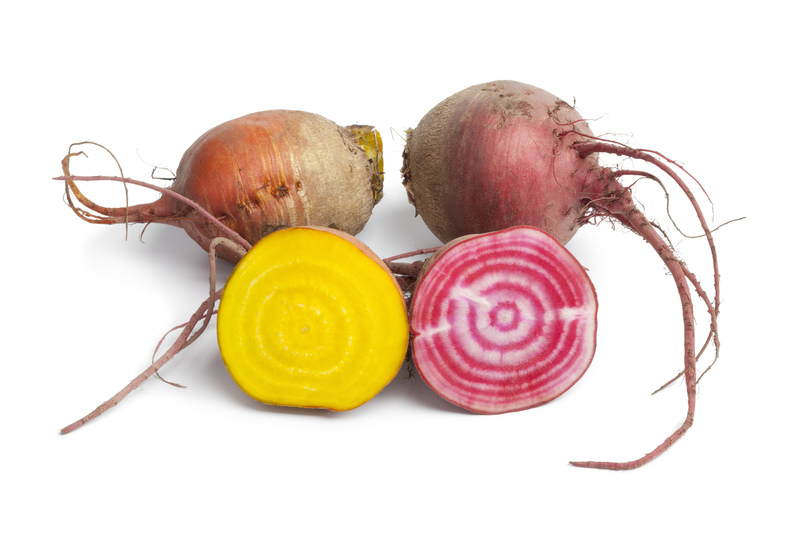 Aside from the commonly recognized red beets, there are also golden yellow and candy-cane striped beets. These are Chioggia beets—yes, originating from the same place as Chioggia raddichio! Golden yellow beets have a slightly mellower flavour than their red cousins, but all taste similarly sweet! Try each variety for yourself. Look for firm beets with a regular-shaped root. If the root is oddly shaped it may mean the beet struggled to grow and could be bitter and tough. If the beet has tops, the beet tops should be healthy and green. 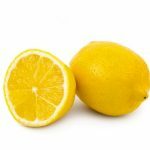 Avoid yellow or wilting tops if you plan on eating them. The beet itself should be firm to the touch. Small to medium-sized beets can be more tender and will cook more quickly than the larger ones. 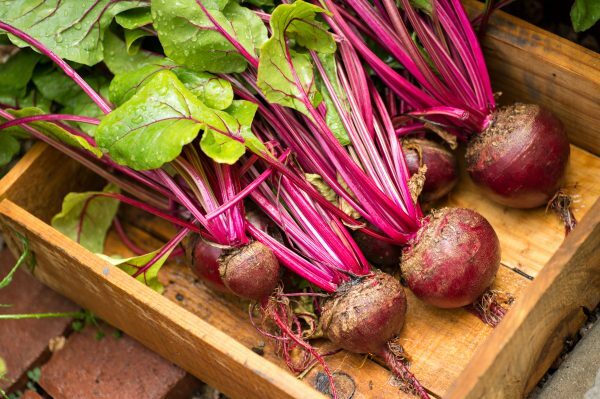 To store beets, snip off the greens and store them separately (leaving about an inch of the stem so that the moisture and nutrients aren’t drained from the beets). It’s best to store your beets inside a bag, in the refrigerator. The roots are known to last as long as two weeks, the greens should be enjoyed in 3-5 days. Beets can be used in a variety of ways: the most common are to roast as a side dish, to pickle for a delicious addition to a burger, or to boil to eat on their own or in a soup. Many people may not realize that beets are also delicious raw! Try adding grated beets to your salads for colour, crunch and sweetness. Beet Greens: Wash and enjoy beet greens raw in a salad or sautéed and served warm with a little olive oil, salt and pepper. They make a terrific substitute for more traditional leafy greens such as swiss chard, kale or spinach. 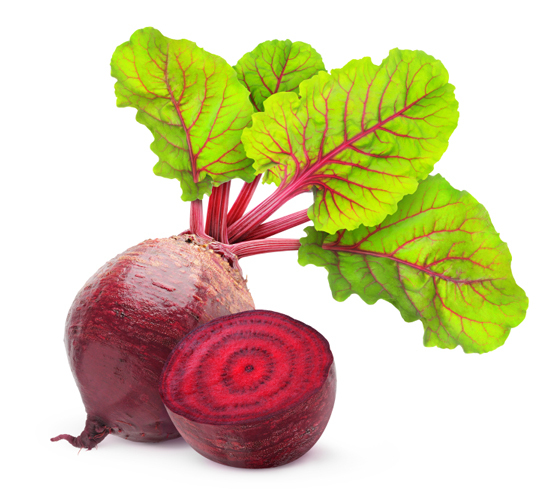 How to prepare raw beets: Carefully use a paring knife or a strong vegetable peeler to take off the skin. 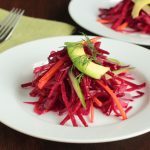 Use a grater to shave off grated pieces for salads, or for a more impressive presentation, use a mandolin slicer or a very sharp knife to cut very thin slices of beets for topping a salad. Use the candy-cane striped beets to wow your family and friends. 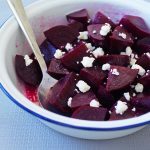 How to prepare cooked beets: If you want to boil, roast, or steam your beets, leave the skin on and remove later, as it’ll be much easier to peel once cooked. 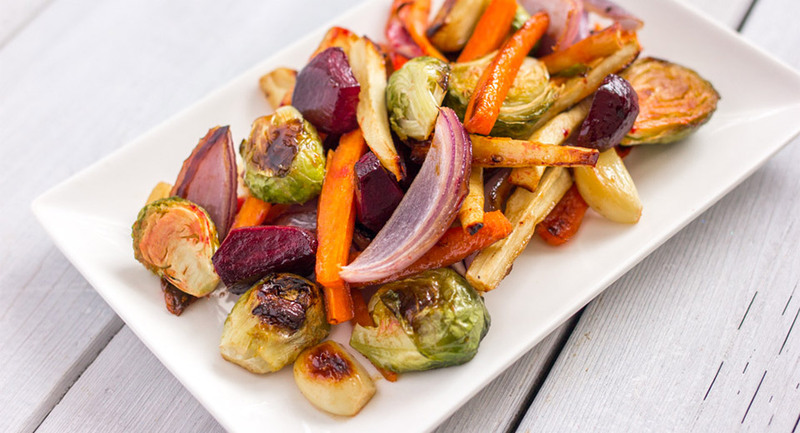 To roast, wrap washed beets individually in aluminum foil and bake in a preheated oven at 400F (200C) for about 50 minutes, until tender. Bigger beets may take upwards to an hour. Test their tenderness by poking them with a fork. Bake for longer depending on how tender you like your beets. To boil, fill a pot of water until beets are covered, and boil until fork-tender. Similarly with steaming, cook beets until fork-tender. 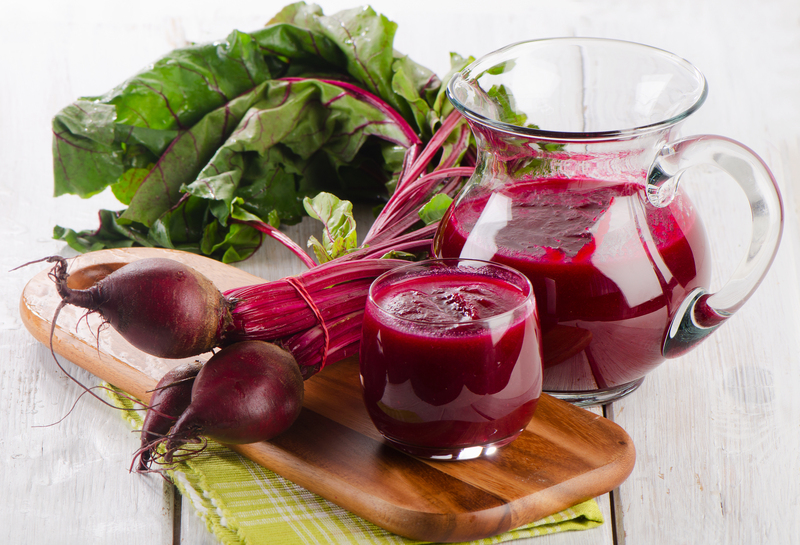 Leave an up to an inch of the stem to minimize the “bleeding” of the beet juice during the cooking process. Do you have some older beets kicking around the refrigerator crisper? They just may be saved. In boiling water, add beets and ½ teaspoon of sugar and salt per quart. If you’re making a salad with shredded beets, the beets will often coat the salad with their dark purple colour. To avoid this, toss them alone with vinaigrette and add to the salad just before serving. To peel a beet as soon as it gets out of the oven, run them under cold water until cool enough to handle. When cool enough to handle, push the skin off with your thumbs under cold water. The water will help the skin to slip off with ease as well as keep your hands free from staining a deep magenta colour. Did you know you can use beets as an egg-replacer in baking? Cook your beets (boil, roast, or steam), peel, then purée. Use ¼ cup cooled beet purée per one egg in your cupcakes or cookies. Don’t know what to do with your beet greens? You can turn them into beet green chips, like you would with kale chips. Simply drizzle 1-2 tsp of olive oil and a couple pinches of salt on top of some dry, torn beet greens, toss, and spread on a baking sheet and bake at 300F until crispy, rotating every 10 minutes. Warm spices like allspice, cumin, cinnamon, pepper, paprika, and caraway seeds (or combined spices like a curry), as well as fresh or dried herbs such as thyme, tarragon, dill, parsley, mint, basil, or coriander. 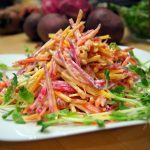 Other root vegetables like carrot, onion, or radishes, as well as other greens like arugula, cabbage, celery, scallions, cucumber, fennel, endive, spinach, and avocado. Complement beets’ mellow flavour with butter, cream, yogurt, or add some tang with kefir, yogurt, sour cream, crème fraiche, or a squeeze of lemon or lime juice. Hard boiled eggs also taste amazing alongside some roasted beets, and beets pair well with almost every meat: pork, beef, duck, chicken or fish. Got a ton of beets and don’t know what to do with them? They are great with a salad, both cooked and raw, but you can also make beet chips for a healthy and fun-coloured crunchy snack. You could add beets to your smoothie, but grate them first unless you have a high-quality blender. Alternatively, juice beets for a refreshing addition to your morning drink routine. Cooked beets are a classic alongside some savoury dinner dishes; add a bit of extra flavour to them by squeezing some fresh lemon juice on top and a sprinkle of kosher or sea salt. 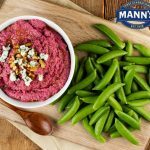 Whiz beets into hummus, or stay traditional and make borscht, a popular soup and common us for beets, especially in European cultures. 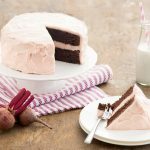 Lastly, don’t hesitate to add grated beets to chocolate cake for a moist, vibrant and somewhat healthier take on this classic dessert.